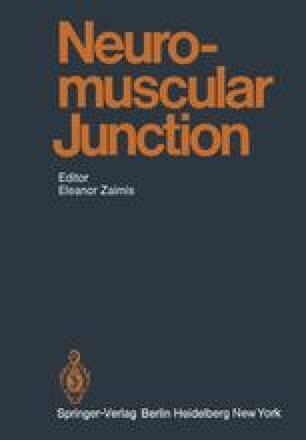 In this chapter neuromuscular transmission will be discussed mainly from an electrophysiological standpoint although some specifically pharmacological topics, in particular the properties of the acetylcholine receptors, will also be considered. Since most of what is known about pre-synaptic mechanisms is based on electrical recordings of the muscle response, we have thought it best to discuss the relevant properties of muscle, as well as post-synaptic events during transmission, before considering the details of transmitter release. The main emphasis throughout will be on results obtained from experiments on isolated tissues; information on corresponding in vivo work, and a more broadly based account of the pharmacology of neuromuscular transmission, may be found in Chapter IV.